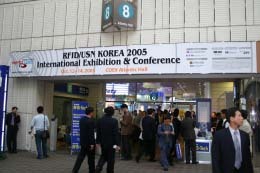 SEOUL, October 12-14,2005 - International Exhibition & Conference “RFID / USN KOREA2005” was held in Seoul, KOREA. Over 28,000 people visited the exhibition in 3days. 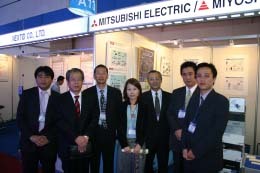 We exhibited Mitsubishi semiconductors for RFID reader and Miyoshi communication equipments under each company’s cooperation. 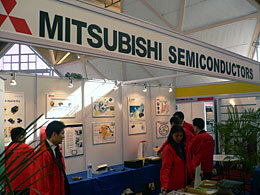 We promoted Mitsubishi semiconductors to reader development companies. Now, UHF band RFID system is focused on the worldwide attention, because this system is almost decided as RFID / USN global standard. So, a lot of people are deeply interested in Mitsubishi semiconductors in our booth. 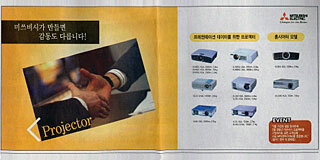 At the same time, Miyoshi Electronics Corporation helped us to promote new communication equipments in Korean market. 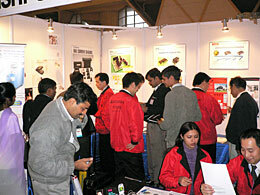 We are satisfied with making a deep partnership with them by this exhibition. RFID system is defined as one of the governmental projects, Korean government and industry work on its development and spread. We aim to supply products smoothly and get more market share in Korea by understanding customer’s needs more deeply. Ho-Chi-Minh, May 23, 2005 - We held Mitsubishi FX series software training seminar at Ho-Chi-Minh Industry University in Vietnam. This university was renamed from The Industrial College No. 4. Last year, Mr. Yamashita, General Manager of Mitsubishi Electric Corporation, visited this university and presented FA educational equipment. 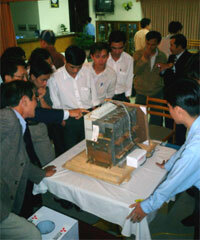 This seminar's purpose is further understanding of their FA product operating skills. The attendants are instructors of the college who teach how to operate the FA equipment. We also appeal the merit of using Mitsubishi FA products to build a strong relationship with them in local market. 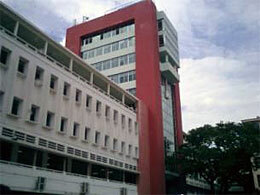 SETSUYO ASTEC VIET NAM OFFICE. 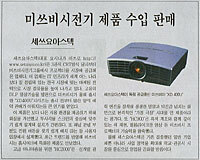 Seoul, May 2, 2005 - We, SETSUYO ASTEC Corp. SEOUL branch, have put an advertisement on the local newspaper and step up progressing sales of our Mitsubishi Video Projector (VP) locally among the most competitive market in the world. Mitsubishi VPs has own technology of the DLP, totally 17 models (incl. LCD model) with ‘XD400U’ series for office use and ‘HC2000’ series for home use, and has rush of demand from many fans in wide range of clients, schools, offices (public/business) and home users. Now we are strengthening more acceptances from the market with our new service such as longer period of the quality assurance and replacing a lamp without charge, etc. The situation of a large size of visual equipment in Korea, the market needs has been changing larger rather than PDP-TV, LCD-TV. More than 60 models has been carried out launches for movies, video games, watching sports and home entertainments last year, and leading force in the market nowadays, our sales of Mitsubishi products also expanding on the wave of the trend. 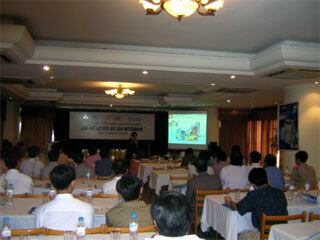 In Danang city Vietnam, April 18,2005 - We held a seminar of Mitsubishi newly developed AE-SW type low voltage air circuit breaker. We appealed new products of Mitsubishi low voltage circuit breakers to potential customers mainly as Power Company. In this market an European company has a large share of air circuit breaker (ACB), but through out this seminar we could promote Mitsubishi products well in this market. Originally Danang, a middle city of Vietnams, has a large demand of MCCB series in stead of ACB series, so we also prompted WSS MCCB series as well. Starting by this seminar we will continue to find our new customers with supporting our technical method individually in this area. India, February 1-4, 2005 - India Electronics show: Componex/electronic India, Pragati Maidens was held in New Delhi, India and over 20,000 people visited the show in 4days. 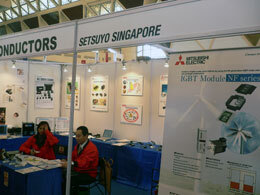 We exhibited Mitsubishi semiconductors, Koshin hall current sensors and Isahaya hybrid-ICs with each company’s cooperation. Through communicating with various fields of visitors, we could get good response for these products future use in India. industry use and high spec electronics are just getting started. It could say India stands on the first stage for shifting the high spec electric goods, which has power-saving function. We expect their demands will increase step by step. We can provide not only semiconductor but also hall current sensor and hybrid-IC. We want to get more market share in India with this strategy. 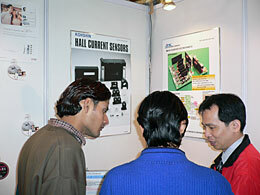 We attended this kind of electronics show last year October in Beijing China. SETSUYO ENTERPRISE (S) PTE. 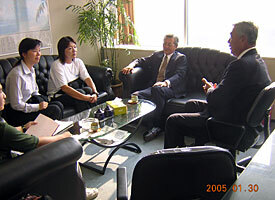 LTD.
Osaka, January 30, 2005 - Setsuyo Astec Corporation (President: Kiyoshi Kawakami) decided to donate in aid to the December 26th, 2004 Sumatran islands off shore earthquake and Indian Ocean Tsunami disaster, through the AMDA (Headquarters: Okayama, Japan). Shohei Shibagaki (Deputy general manager of FA and Industrial Division) and Koichi Nakamura (Representative of Indonesian office) also attended this contribution in Jakarta. President Kawakami also said "the AMDA is supporting medical and life of all victims. The importance is clear." 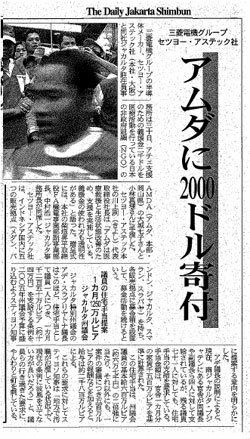 to the local press, The Daily Jakarta Shinbun. Setsuyo Astec Jakarta will keep contribution with a charity fund box at all of our Indonesian offices (Medan, Bandung, Jakarta, Semarang and Surabaya). On the other hand, Setsuyo Astec Osaka (Head office) also decided to donate through the UNICEF.